The Clark Kents of the Wood River Valley may not be faster than speeding locomotives or be able to leap tall buildings in a single bound, but they manage the superhuman feat of paying the bills while following their dreams. By day, Mark Sheehan is a mild-mannered ice rink maintenance man for Sun Valley Co., driving an Olympia ice smoother in one large spiral day after day. By night, he wields fire, using it to forge metal—mostly steel—into elaborate sculptures. "If a person is simply a guest and they're here for a weekend, we don't often strike up a conversation and find out I'm more than a janitor," Sheehan said. "The locals, however, a number of them have taken the time to learn about what I do." The dichotomy is nothing new to Sheehan. After going to art school in California, Sheehan and some fellow art students moved to Idaho and attempted to start an art gallery. "That failed immediately," he said. "That's when I learned I could wash dishes." Sheehan washed dishes at the Ketchum Country Kitchen on Main Street in the early 1970s, also dishwashing and working as a prep cook at Mulvaney's across the street. His day jobs since have been varied and many, including a nine-year stint as a deputy and firearms instructor for the Blaine County Sheriff's Office. All the while, he was honing his craft. He founded his company, Cherry-Glow Forge and Fabrication, in 1976, eventually amassing a client list that now includes Sun Valley Co. and Herb Allen, founder of the Allen and Co. boutique investment bank. 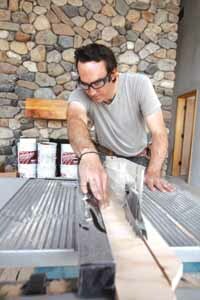 James Fisher, a carpenter for Lee Gilman Builders, is another valley man living a double life. A self-described "journeyman drummer," Fisher has balanced drumming with carpentry for almost 15 years, playing in what he estimates to be 20 different bands during that time. "Music has never really paid the bills," he said. Carpentry—a skill he learned from his father—gave him a flexible, decent schedule and a way to make ends meet. But he said the dichotomy between how people respond to him as a carpenter and a drummer is striking, though it was more so when he was living in Los Angeles. "If you introduce yourself as a drummer—well, I almost never do, because that's not how I make my money. [But] it's amazing, the difference." Fisher said the men he works with at Lee Gilman are surprised when they find out he plays the drums. The response is even more extreme when they see him in action, he said, such as when he plays at the Silver Dollar Saloon in Bellevue, where many of his co-workers go to unwind. "The reactions can be pretty funny," he said, describing them as "shock and awe." "They're just bewildered, how I'm able to do both things," he said. Sometimes the difference is not so striking. For Jason Spicer, aka "Train," bartending at Whiskey Jaques' in Ketchum and playing bass in local band Triple Nixon tend to go hand in hand. However, he said, he sees a difference in how people react to him in his different roles. "When you're playing music, people don't treat you like you're serving them," he said. "It's still kind of serving people, but it's in a different fashion." While none of them want to give up their night lives, the men agree that there are advantages to being Clark Kent during the day. "There are more bonuses than there are challenges," Spicer said, adding that he loves being a bartender. "It's not the same thing every day. Obviously, you're making drinks, but everyone is different, especially in a town like this. There are some interesting stories." Spicer said he also uses the opportunity to give his band some publicity, making sure visitors and locals alike know the dates of Triple Nixon's next gig. For Sheehan, working the ice rink gives him a social outlet he might not otherwise have. "My business tends to leave me in the shop by myself," he said. But at the rink, he can connect with his co-workers as well as lodge visitors—including Olympic skaters, whom Sheehan describes as fellow artists. "I'm in awe of them," he said, adding that he finds them inspiring. Spicer, too, said he enjoys the inspiration he sometimes gets from the other live bands that play at Whiskey Jacques' when he's working. The schedule there suits his practice schedule, too, he said, and his fellow bartenders are willing to switch shifts and pick up some extra cash when he needs help. Still, it's not always easy. "There have been times when you have to go to rehearsal and you're just not into it," he said. "Especially when you're getting into the season, maybe I've worked a bunch of nights in a row, and I finally have a night off. The last thing I want to do is rehearse." Fisher is no stranger to the pressure of balancing, either. He said his carpentry work is so physical that a full day of work followed by a three-hour rehearsal can be "draining," leaving him completely exhausted. He said he usually manages to avoid burning out by changing bands or changing the music style he plays. Right now, he said, he's not in a band because he felt himself on the verge of a burnout. Sheehan manages to balance his craft with his day job now, but that wasn't always the case. His career choice to move to the Sheriff's Office in 1997 was the result of a burnout, he said, after which he gave up forging for a while. "I suppose you'd call it a midlife crisis," he said. "But it took me nine years of working for the Sheriff's Office to find out that I actually had a good thing." Sheehan was a firearms instructor for the county before becoming a deputy in the jail. It was a steady job, but one Sheehan said he wasn't suited for. "Treating everyone with respect but still being able to shoot them on the spot" was the hardest part of the job, he said. "That takes a special person, and I'm not it." Sheehan said the benefits that Sun Valley Co. offers are excellent, but he can't see giving up forging again after the hiatus he took while working for the county. Going full-time with their passions would be even tougher for Fisher and Spicer, who say they try to be realistic about their odds of breaking into the big-time music scene. "There were periods where I hoped I could, [but the] reality is that it doesn't really happen," Fisher said. "It's a harsh reality, but it's something that you realize after 20 years as a musician." "You try to be realistic," Spicer said. "It's really tough and it takes a lot of time. Every musician would like to have it as their job, but there's a lot of people out there." Faced with the threat of burning out and the slim odds of making it big, disillusionment and discouragement would seem almost de rigueur. So why do these men continue to juggle work and their sidelines? Sheehan said it boils down to one simple concept. "Passion—that's the key word," he said. "Maybe it wasn't the wisest choice in terms of putting aside for retirement. I don't have a 401(k). I never thought that far ahead. But forging is truly my passion." Fisher said he doesn't really have a choice—that he's compelled to keep on playing, no matter the cost. "It takes endurance and passion. It takes a lot of drive," he said. "[But] it's something I have to do or I'm just not happy."